The rally in support of Muslims in Myanmar was peaceful and almost noiseless. 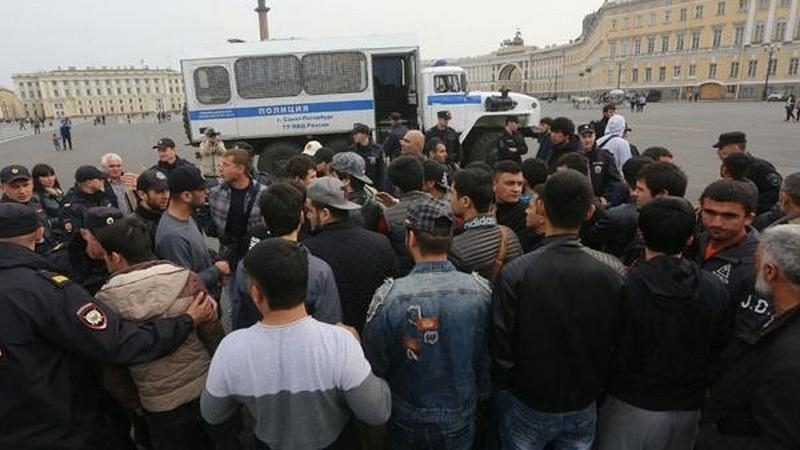 The police detained more than 130 people who came to an unauthorized rally in support of the Myanmar Muslims at the Palace Square in St. Petersburg on September 10, the Fontanka newspaper reported citing sources in law enforcement agencies. "Protocols are being filed under articles on violation of the rules for holding rallies and resisting the police," the source informed. A total of about 200 people took part in the rally. Earlier, September 3 in Moscow, an uncoordinated action in support of Muslim Rohingya was held outside the embassy of Myanmar. Demonstrators created a petition against the authorities of Myanmar with a demand to stop persecution of Muslims. Another outbreak of violence in Myanmar has sparked massive protests in Bangladesh, Indonesia, Turkey and Pakistan. On Sunday, September 3, protesters in Jakarta (the capital of Indonesia) threw Molotov cocktails at the Myanmar Embassy. The Myanmar Army's statement, published on September 1, specifies that since August 25, there have been 90 clashes, during which 370 militants of the movement Rohingya Solidarity Organisation were killed. Losses among government forces amounted to 15 people. Myanmar also accused militants of killing 14 civilians.